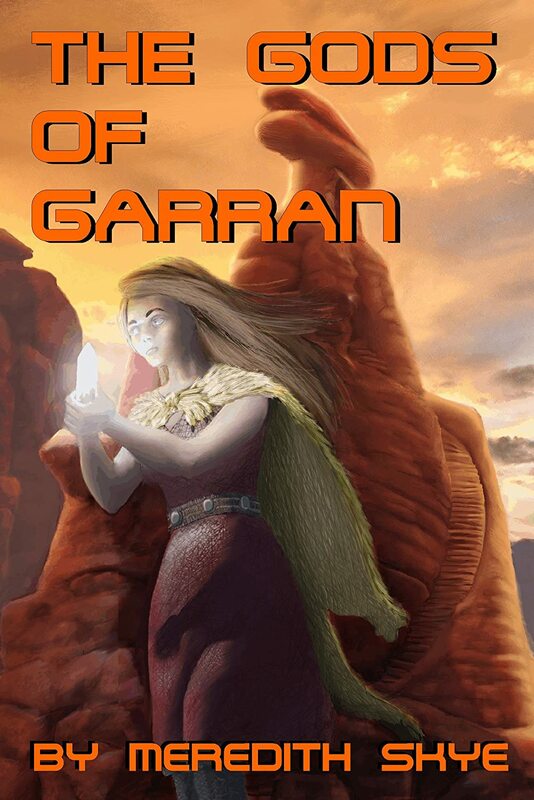 “The Gods of Garran” by Meredith Skye is a story about a planet besieged by conflict. Long ago the spirit of the planet of Garran bonded with seven of the tribesmen creating spiritual leaders called the Borrai who communed with the earth and wielded their power to maintain the peace between the tribes. Then, the invaders came from the sky. The Chanden invaders killed the Borrai and used their powerful technology and weapons to take over the planet of Garran. The Garrans natives were forced to give up there ways and follow the Chanden laws and learn their language. One hundred years later, the Garrans, angry at injustices brought on them by this superior race, are stirred up to revolt. Some of the tribes turn to new and violent gods and call for a bloody war. Others seek out the godstones of old, in the hopes of creating a new Borrai, one that can speak for the world of Garran and fight back against these invaders. One young man, Moorhen, the son of a tribal chieftain who has chosen to fight is in danger of being banished from the tribe for speaking out against violence. He falls in with a group who is searching for the godstones. There, he meets a mysterious native girl, named Etsel, who is god-touched. The others believe that she can lead them to the godstone. If so, perhaps the coming war can be averted. But there is more to Etsel than the others realize. Is she truly loyal to their cause? More is at stake here than Moorhen’s own heart. Once they find the godstone, one of them will have to bond with it and when they do—they might be in danger of losing their own identity. But in the fight for this planet, Moorhen believes it will be worth it. Meredith Skye lives in the Land of the Midnight Sun, in Alaska. She loves to travel. She loves swords, castles and ancient lifestyles. She loves Celtic art and music. She’s a vivid dreamer and many of her dreams come back to life in her stories.